Okay, how does one deal with such a plethora of music? Does one start with disc one and work one's way through it? One thinks not. One thinks one jumps about, checking out the items one most wants to listen to first. Then one goes back and examines the other material. I have been trying to decide how to report on this. Should I present all the negative stuff first and then close with the positive? Should I do the reverse? Should I mix them? This is not just an academic question; I am trying to figure out the best way to tell you that while I have reservations, I think it would be a mistake not to get this set. Okay, the first thing I listened to was Stokowski's performance of Beethoven's 2nd Symphony. I was blown away. If you want to hear the 2nd with foreshadowing of the "Eroica" this is it! The intensity is visceral. Notes indicate that the audience broke into applause at the end of the scherzo and that Stokowski had to gesture to the orchestra to continue. The premature applause is edited out here, but you can understand why it occurred. Unfortunately, then comes a Beethoven 7th that I found underwhelming. I listened to it several times and began to wonder if I was just "off" the piece. I pulled out Stokowski's Symphony of the Air recording and cleansed my brain. One writer I came across praised the finale, and you may have much different reactions, but these are mine. In fact, I questioned my reactions to the point that I asked a friend's opinion. Anthony Fast, Captain Classics, is out of Florida and has this to say, "Well, Bob, I had a VERY different reaction to this performance, and it may be the point of widest divergence of viewpoint on this set. It's one of the finest 7ths I've ever heard. In the same class I put the 1956 Boult recording on Vanguard, and an early 80s live performance by Lovro von Matacic and the NHK Symphony of Japan that received short-lived distribution on Denon. I have a tape of a live 1967 Tanglewood performance by Erich Leinsdorf and the Boston Symphony that exceeds even the two previously mentioned recordings. I attended the concert, and can say unequivocally that it's much more exciting than his RCA studio recording of the same period, and that's quite fine. There are many others that I enjoy, but the above are my favorites. "It's been reported to me by a very reliable source who attended the Ferencsik concert (Steve, The Titan, Reveyoso) that the Orchestra was reduced to not more than 45-50 players for this performance. That explains the balances that somewhat thins out the strings and brings the winds and timpani forward. I like it this way, and with the careful preparation that obviously went on in rehearsal, all sorts of details emerge clearly that are not ordinarily heard in recordings of the 7th on modern instruments. "I generally found all the tempi quite natural and right feeling. I like the 1st Movement to be moderate and sharply etched, and any sense of the frenetic saved for the Finale. I would have preferred more stentorian horn playing as you hear in Stokowski's New Philharmonia recording and in Bruno Walter's stereo CBS issue, but the horns are certainly not lacking in definition. Both Leinsdorf and Matacic insert a timpani crescendo in the climax of the development that Beethoven didn't indicate, but it's so effective that I miss it when it is not done, as here. The Funeral March is not quite the true Allegretto observed by Toscanini and Szell in their great recordings, but neither is it the dirge that both Furtwängler and Stokowski make of it. At 9 ½ minutes, it goes exactly right in the context of the rest of the performance. I'm not a great fan of the Scherzo of the 7th (Beethoven is NOT my favorite composer! ), and Ferencsik makes more of it for me than most conductors, and thankfully eschews the repeats!. The Finale is one of the best, frenetic in spirit, but not in execution. The playing is marvelous, only the above-mentioned Leinsdorf being more exciting. I do miss Stokowski's braying horns, but no one lets the timpani pound more powerfully than Ferencsik does here, and that's more than ample compensation. "I was quite OVERWHELMED by this performance, and the sonics are wonderfully natural. This is for me, one of the highlights of the set." Later in the scheme of things I went to the Mahler. For some reason I recall someone telling me what a phenomenal performance it was. I will go on to say that I would likely recommend this set just to hear Martinon's Mahler 3. My God, what an experience. I have two other recordings of this piece, Horenstein and Bernstein. No slouches there, either. Neither of them, however, brought this piece to my attention as forcefully, as musically as this one. The first movement in Chicago is over a minute quicker than Horenstein and over two than Bernstein on DG. This creates a greater sense of drama and the attacks are much sharper. The following resolution is, as a result, absolutely dark and devastating. More than the other two recordings, this one captures the "events out of time" essence of Mahler. To be honest, and I duck back into my trench here, when I listen to Bernstein I lose interest. I read somewhere that Mahler referred to one of his symphonies as "the craziest thing I ever wrote.' If he wasn't talking about the 3rd he should have been. It is this bizarre quality that Martinon brings to the music that I don't feel with Bernstein or Horenstein. Time and again I found myself mesmerized by the performance. As I said, the price of the set is worth it to hear this. Warning!!! Program the player to quit before the Shapey stuff on disc five. I recently didn't read a chat on atonal music. The Mahler begins on a disc that includes the first movement of Bruckner's 7th with Paul Hindemith conducting. I was a bit puzzled by such an inclusion, especially when there is a Tennstedt recording of the whole piece on another disc. Well, I only wish they had been able to include the whole piece by Hindemith. This is an incisive reading, much more intense than Tennstedt. While I know there are those who will be pleased to have Tennstedt's only existing recording of this Bruckner, I was not as taken by it as by Hindemith. Anything by Monteux is welcome, however, especially as there is nothing in my collection where the Maestro conducts Wagner. In fact, in the 15-disc Monteux edition issued by RCA in 1994 there is not a single Wagner piece to be found. On the other hand, while this is a lagniappe much appreciated, you probably wouldn't purchase the set just for this 6-minute piece. Next comes the Prokofieff 3rd. Before going into that, however, a digression to discuss the disc's soul mate, a Tchaikovsky 4th with Reiner. I will make it clear at the outset that I do not appreciate Reiner's way with music. While not a firm yardstick, my measuring rod places Toscanini, and Szell* at one end of a continuum that contains Furtwängler and Stokowski at the other. I cannot really say exactly what the difference is, but I can hear it. Reiner's way with music is closer to the left side of the continuum and I tend to prefer the right. So, my response is that those people who like the TSR approach will undoubtedly like the Tchaikovsky much more that I. Then there is the Prokofieff. This is another gem in the collection. For some reason whenever I listen to Prokofieff Charlie Chaplin comes to mind, particularly "Modern Times". Don't ask me why, I am just reporting. The same reaction hit me right from the opening of the 3rd. I feel the same way whenever I hear his orchestral works. 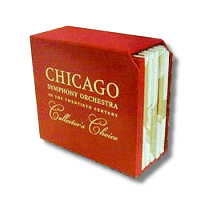 My only comparison at hand is Walter Weller's good London Philharmonic recording (in a boxed set, London 430782, of all the symphonies, last available on RCA's classical club's web site). I am not that familiar with the concertos or chamber music to make a similar claim, but it occurs to me that this is an area worth investigation. Sorry about that. Anyway, this is another gem in the collection. Kondrashin is a genius and this interpretation easily is the most incisive I know. By the way, this review was somewhat delayed because listening to this recording I got sidetracked and had to listen to more Prokofieff as I reconsider his stature as a composer. Next in the scheme of things was the first disc. At first glance I wondered why a Beethoven 1st with Fritz Busch. To be honest this is the first time I have ever heard him conduct. Listening to this indicates I may have been missing something. The performance is as exciting as Stokowski's Beethoven 2nd! The Stock item is okay but not particularly memorable. The Schubert is a real winner. The first classical LP I can recall my father having was Bruno Walter's stereo recordings of Schubert's 8th and Beethoven's 5th. I still have that disc. This Chicago performance is much more intense, almost 3 minutes faster! At the same time it is not driven. I don't think Walter could perform a piece in a driven manner. It has the same Schubertian lyricism you hear in the stereo recording. This was, by the way, performed a mere ten days after the New York Philharmonic recording. I confess that this is probably the first time I have ever heard the Schumann piece. I don't appreciate Schumann. Entschuldigen Sie. I had definitely never before heard D'Indy's suite based on the 1739 tragedy, Dardanus, by Ramaeu. Neat stuff, really lovely music (though not "tragic") and never recorded by Munch so this is a double bonus. Okay, on to the Debussy disc. I am sorry, but after repeated listenings, nothing seems to stick with me. I had high hopes for the Ansermet orchestrations. A friend of mine told me that his introduction to Pelléas und Mélisande was the Leinsdorf recording of excerpts and recommended it to people as an introduction to the opera. Sorry, but no dice. I recently reviewed a Stokowski recording of music by Debussy and know that his music is much more than what I am hearing here. Thinking about it a lot, and going back to the Stokowski recordings I recently reviewed, I believe that the problem in both cases is that the orchestra has almost all the work. There are occasional solos, but not nearly enough to keep my attention. I would go so far as to say that it is, in this sense, not Debussyian. The Copland is Copland. I am sorry, but I am in a non-Copland mood of late. Maybe for the rest of this visit on this planet. The Bizet piece is not particularly memorable either. Okay, on to disc nine. The Roussel is, as expected, a great performance. I have three different recordings of this piece by Munch and they are all fantastic. The audience's tumultuous response at the end is proof of the pudding. The Corigliano piece is very nice, concluding with variations on "Happy Birthday" to the 75 year-old Maestro Solti. The Bartók is everything you would expect from Sir Georg. The first part is like a Van Gogh portrait, the second is Picasso. I did not like the Carter; too much dissonance and antonal stuff for me. If you like this kind of dish you will undoubtedly have a different response. The Busoni was really neat, making me want to learn more about this composer. Finally, to the last disc. The Busoni/Mozart is absolutely fantastic. My reservations about Barenboim as a conductor seem baseless as I listen to his live performances in this set. The Giulini is as great as you would expect from such a genius. This is my first time hearing the Beethoven. It sounds very good to me, I especially like Heppner, but I have no comparisons to make and so my opinions are really that of a novice. Well, we are finally getting towards the end of my initial commentary. If at this point you are still deciding whether or not to get the set, put aside my qualifications. As I mentioned at the beginning, the set is uneven, as all sets are, but the pluses outweigh the minuses by a mile. The Mahler 3rd, Prokofieff 3rd, Beethoven 2nd and 1st are reason enough to support the orchestra with your donation. Are these things still tax deductible? My wife handles all these matters now. A few last thoughts. After I finished this review, I considered rearranging the paragraphs to reflect the chronological order of the discs in the set. Then, I asked myself, why? To make it easier for the mathematically challenged? Is one order more or less logical than the other? Sorry about that. * On the other hand, Szell's Cleveland recordings of the last three Dvořák Symphonies, on Sony, are among the greatest ever. For some reason, when it came to Dvořák, Szell got lyrical. Did anyone ever accuse Toscanini of being lyrical? Sorry… can't help it some times. P.S. Writing this review has been an almost Mahlerian experience. I don't mean to sound pompous. What I mean is that it swirled together not from first to last, but from some other form of coherence. Just wanted to share that.